At what point do we stop pretending that Roe v. Wade is still the law of the land? In 1992’s Planned Parenthood v. Casey, the Supreme Court fumbled when it asserted that abortion regulations could not put an “undue burden” on women. This vague language opened the door for legislators to cleverly manipulate the law and then portray their attack on freedom as a mild inconvenience. Since this time, the anti-abortion industry, with the assent of right wing activist judges, have gutted the right to choose. Those who want to dictate women’s reproductive choices keep relentlessly stretching the meaning of “undo burden” beyond reason. 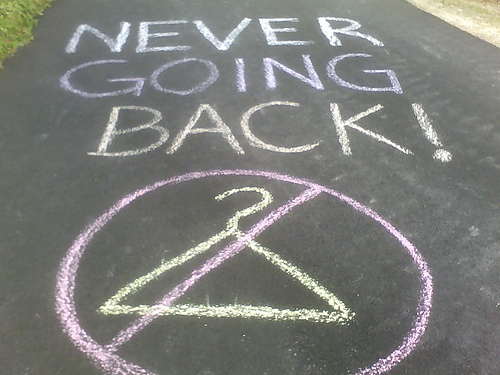 First, they used harassment outside of abortion clinics to limit the number of providers. Next, these groups strategically employed inflammatory language to incite violence against the few remaining doctors who were brave enough to endure the taunts and terrorism. The “burden” keeps growing, making it more difficult for women to exercise their constitutional right to end a pregnancy. This week, Louisiana’s theocratic legislature, the same one that recently attempted to declare the Bible its State Book, passed a bill that might shutter three out of the state’s five abortion facilities. In the Deep South, the barriers to having a safe abortion are becoming unreasonable. The new Louisiana law is similar to recent ones passed in Alabama, Mississippi, and Texas – making it nearly impossible to cross state lines to terminate unwanted pregnancies. Could he be any more disingenuous? Complications that lead to hospitalization occur infrequently. In the rare cases when a trip to the hospital is necessary, emergency rooms take all patients – so admitting privileges are irrelevant to the health of these women. Jindal’s contrived words will never mask the fact that abortion clinics are significantly safer than the coat hangers he presumably prefers. It is particularly cynical for these extremists to demand admitting privileges, considering that abortion providers don’t have the credentials because they are from out of town. And, the reason they are from different geographical areas is because it is often too dangerous for a doctor to live in the same town where he terminates pregnancies. Another crafty way to circumvent Roe. v. Wade is requiring clinics to adhere to strict building codes and equipment requirements. In Texas, a new law enforcing such nonsense will go into effect on Sept. 1. The result will be that women in poor rural areas, such as the Rio Grande Valley, will have to travel up to 150 miles to find a clinic. With the entire south eviscerating the right to choose, women may soon have to travel as far as 300 miles to end their pregnancies. This is an outrageous attack on the poor who can’t afford to travel, or can’t get time off from their low wage jobs. These backward laws only serve the whims of hypocritical rich Republicans who can preach against abortion, yet clandestinely fly their daughters to Blue States to end their unintended pregnancies. The anti-abortion industry isn’t even circumspect about the genuine reason for such ridiculous measures. “These incremental laws are part of a greater strategy to end abortion in our country,” Tanya Britton, a board member for Pro-Life Mississippi, told the New York Times. The United States Supreme Court needs to get its act together and stop messing with women’s lives. Either abortion is legal or it isn’t – and it is their job to stop the game playing and categorically decide. It is pure silliness to be asking random judges to decide on the nebulous question of what constitutes an “undue burden.” If a wealthy person has access to a private jet, then flying to France may not be an undue burden, while it may be a hardship to travel thirty miles for a woman without a car who works double shifts at the Waffle House to make ends meet. If American women don’t have access to abortion clinics in their own neighborhoods – it is an undue burden — and if it weren’t for the “pro-life” thugs such facilities would be widely available. This legislative cat and mouse game that insults our intelligence must end. The anti-abortion movement has made its end game clear and it is up to the Supreme Court to finally embrace or reject the right to choose.